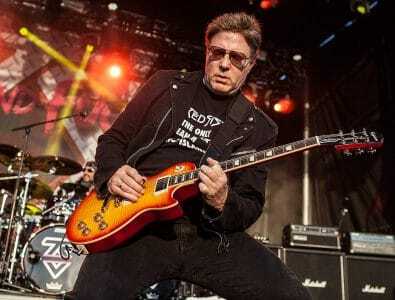 Twisted Sister guitarist Jay Jay French was recently interviewed by Heavy Metal and Booze at this year’s Days Of The Dead convention, which took place in Chicago, Illinois, USA on November 16, 2018. “I don’t think the band ever processed it. But that’s just the band. We were too busy doing something else. There was too much other stuff happening at the time. But he certainly, I think, was stunned [by] the misrepresentation of what our music was. It was fun stuff, and the videos were very cartoony. It wasn’t a threat to the moral fabric of America [like] we were accused of being. I think he was stunned by it, and I was stunned by it, because the band was the straightest rock band in the world. We didn’t allow drugs and alcohol in the band; we fired anybody who did it. That’s not the story of Mötley Crüe or anybody else; it’s our story, though, so that’s our thing. We were so straight and we were so hard-working, and the fact that we were being accused of stuff when we were probably straighter than half those congressmen who were questioning us who probably had alcohol and drug problems and we didn’t. We sat down with Jay Jay French from Twisted Sister and discussed some of his musical influences, the future of Twisted Sister, if there is one, and we talked about metal being underappreciated in the US compared to other countries.